The CliftonStrengths is only the start of strengths-based development. 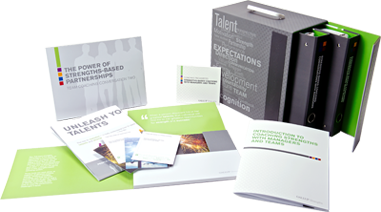 To get the most out of strengths, Gallup offers strengths coaching kits. 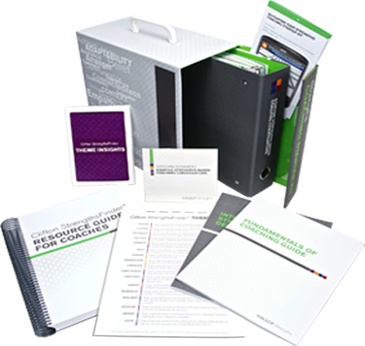 These kits feature comprehensive coaching materials and provide a wealth of resources that will enable you to begin coaching and developing others. For coaches who believe an individual's greatest potential for success lies in building on his or her natural talents, this kit provides a full analysis of strengths-based development and how to use it to coach others. Tailored specifically for coaches new to strengths-based development, this kit is loaded with materials designed to educate coaches at all experience levels on how to help others understand, apply, and integrate CliftonStrengths results into their lives and organized roles. If you are truly passionate about coaching strengths, we encourage you to attend the Successful Strengths Coaching course, which includes a complimentary Strengths Coaching Starter Kit. When employees have the opportunity to do what they do best every day, there is a profound improvement in individual, team, and organizational performance. This kit provides coaches with successful strategies for helping managers and teams maximize their individual and collective talents to reach desired performance outcomes. It includes everything a coach needs to address specific team-related issues and challenges using strengths-based development. If you strive to develop managers and teams to their highest potential, we encourage you to attend the Coaching Individuals, Managers and Teams course, which includes a complimentary Coaching Managers and Teams Kit. NOTE: This kit is for coaches familiar with strengths-based development who have a firm comprehension of the CliftonStrengths assessment and themes. If you require an introductory approach to coaching strengths, consider the Strengths Coaching Starter Kit.